WSO provides expert advice on state actions that impacts birds. WSO monitors Wisconsin’s legislature and state agencies to identify pending changes in policies and regulations. Examples include written comments on master plans for state properties and attending public hearings to ensure that Wisconsin’s bird community has a voice. WSO strives to alert members and the public to situations and practices that threaten Wisconsin’s bird populations. WSO recently developed an issue paper to alert citizens of the possibility of a Sandhill Crane hunting season in Wisconsin. WSO owns more than 400 acres of important bird habitat in the state: 60 acres within the Buena Vista Prairie Chicken Management area of Portage County, and 372 acres in the Baraboo Hills of Sauk County. WSO’s ownership and sound management of these properties ensures their preservation for future generations. WSO supports wetland conservation by offering Federal Duck Stamps for sale. Since 1934, $800 million in proceeds from Federal Duck Stamp sales have helped acquire and protect more than six million acres of wetlands within the National Wildlife Refuge System. WSO offers Duck Stamps at cost ($25) and also sells Duck Stamps with a reusable clear-plastic key-ring-type holder ($28.50). 2019 Duck Stamps may be available again by June 2019. The Wisconsin Bird Conservation Initiative (WBCI) is a partnership of more than 150 organizations around the state. Partners include bird clubs, hunting and fishing groups, government agencies, land trusts, nature centers, environmental groups, universities, and businesses. Goals of WBCI include to conserve and restore endangered, threatened, and rare bird species and their habitats, educate Wisconsin citizens about birds and bird conservation issues, and promote bird-based recreation and the enjoyment of birds. WSO is an active supporter of WBCI and currently serves on the WBCI Steering Committee. WSO Board member Michael John Jaeger serves as the WSO liaison to WBCI. An Important Bird Area (IBA) is a site that provides essential habitat to one or more species of breeding or non-breeding birds. Sites may vary in size, but are usually discrete and distinguishable in character, habitat, or ornithological importance from surrounding areas. The Wisconsin program was launched in 2004 and the first phase, the nomination phase, was largely completed by 2007. Eighty-six sites were approved and described in the 2007 publication Important Bird Areas of Wisconsin. WSO has provided financial support to this program since its inception. Billions of birds and other wild animals fall victim to cats every year. America’s native wildlife is under ever increasing pressure from shrinking habitats and other man-made threats. The added hazard posed by non-native domestic cats could be the final straw for some species. The American Bird Conservancy along with WSO encourage you to keep your cat indoors. 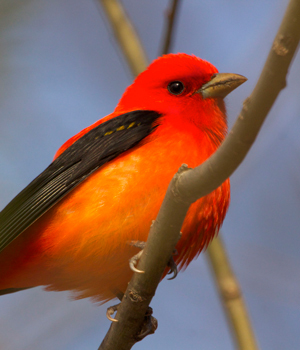 The Bird Conservation Alliance is a network of organizations working together to conserve wild birds. Through the Alliance, millions of birdwatchers and concerned citizens are united with conservation professionals, scientists, and educators to benefit bird conservation efforts. The Alliance’s goals are to prevent further bird extinctions, to reverse declines in bird populations, and to assure the protection and management of sufficient habitat to effectively conserve populations of the full range of native, wild bird species for the future. WSO is a member of the Bird Conservation Alliance. The purpose and mission of BRAW is to monitor and increase the production of the Eastern Bluebird and other native cavity-nesting birds through a coordinated statewide nest box construction and monitoring program. BRAW seeks to expand public knowledge and enthusiasm for the Eastern Bluebird so that a growing number of people will have the desire to aid cavity nesters and have the knowledge about how to best accomplish this in their own communities. WSO Board member Jenny Wenzel serves as the WSO liaison to BRAW. The All Bird Plan synthesizes the requirements and conservation issues of 116 priority bird species and provides recommendations for habitat protection, restoration, and management that will have the greatest impact on state bird populations. Wisconsin’s wildlife action plan is a strategic approach to wildlife conservation. It was the result of a statewide effort to identify Species of Greatest Conservation Need (SGCN), and outlines priority conservation actions to protect species and their habitats. Species guidance documents are peer-reviewed publications with comprehensive information for rare species tracked by the Natural Heritage Inventory or identified in the Wisconsin Wildlife Action Plan as a Species of Greatest Conservation Need (SGCN). They contain identification, life history, management guidelines, screening guidance and avoidance measures and are intended for a wide variety of users, including resource managers, private landowners, contractors, students and the general public. This series describes birds of both natural and altered habitats, but focuses on relatively undisturbed natural areas. This information is useful to birdwatchers, which are often interested in knowing what species they can expect to find in a particular habitat. Knowledge of the habitat of certain birds is equally important from the standpoint of conservation, for it can be a crucial factor in guiding land use decisions.